The clock is ticking. As I write you have less than a day to experience the last great Austro-Germanic symphonic outpouring of the twentieth century played by the first new great orchestra of the twenty first century. 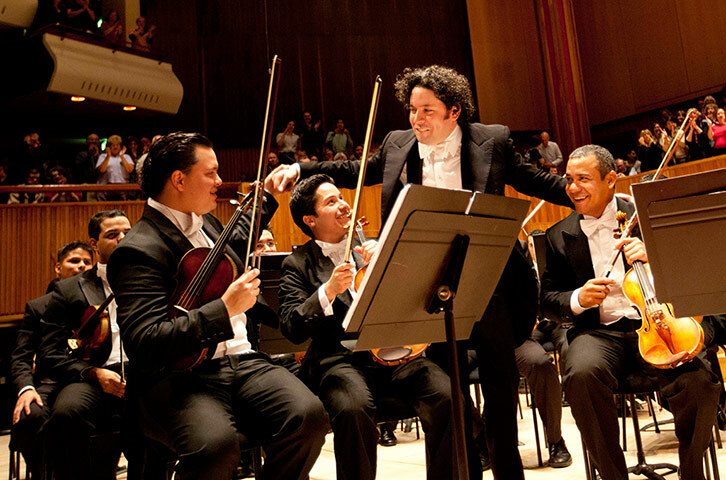 At 19.30 GMT on 4 July 2012 (I hope I have the time right), the Guardian webcast of Gustavo Dudamel and the Símon Bolívar Symphony Orchestra of Venezuela playing Strauss’s Alpine Symphony in London’s Royal Festival Hall on 26 June finally expires. Forever. The sense of something momentous finally being expunged couldn’t be more appropriate as a moniker for the Alpine Symphony that was Strauss’s last great large scale score. After two decades of the cycle of tone poems that occupied him from Don Juan in 1889 to Symphonia Domestica in 1904 and the two explosive operas Salome (1905) and Elektra (1909), the Alpine Symphony is like a massive full stop that is impossible to pass through, round, under, or above. Even a fourth dimension wouldn’t do it. it is the very definition of immovability. And not only in Strauss’s output but also on the entire Austro-German tradition that had dominated classical music composition since the early days of Haydn in the middle of the eighteenth century. Strauss went on composing, extraordinarily, for another thirty years, but now occupying himself mainly with sophisticated and essentially domestic slighter scale operas, before the post second world war Metamorphosen and The Four Last Songs signalled his last and essentially backward looking masterpieces, with nothing less than nostalgia incarnate. The great gestures of Salome Elektra, Heldenleben and the Alpine Symphony were gone. The Alpine symphony is in so many ways the quintessential piece of music that ends, not simply an age, but an epoch. How apposite then that it was composed in the opening years of a war, sitting alongside some of the first military horrors to be described as a ‘world’ war and before the decades of what Alex Ross called the Art of Fear. Although the piece (written in a series of sections portraying a day long ascent and descent of a mountain) has some of the most miraculous scoring and blazing climaxes -the long Summit and Vision sections at the centre of the piece are amongst the most ecstatic music ever written – the end of the piece grips a very different set of emotions. As every descending note of the B flat minor scale that began the piece is once again, slowly, inevitably and softly piled one note on top of another, to collapse finally with one last exhausted downward portamento slide, you feel a man retreating into his own personal bunker and shutting the lid firmly behind him. The final four movement titles describe this shattering closing peregrination with utter precision: descent – sunset – departure (‘Ausklang’ in the German original, a word that encompasses the multiple senses of conclusion, finality, ending and passing) – and then simply, night. Or death, if you prefer. After all, that was what was going on around him at the time. Never has the Zeitgeist of an era been more appropriately designated. To perform this terrifying endgame on the Guardian webcast you get one of the world’s youngest, most popular and also optimistic symphony orchestra and conductor combinations of today. The new and bright rendering the old and closing in a quite bizarre but successful pairing. And thanks to the direction of Chris Swan and his team, you can see them do it in a way that was simply impossible in the hall itself, no matter what price you paid for your seats. The democracy of this is simply wonderful. So here to open the piece for example – and at many points throughout – are copious full screen shots of Gustavo Dudamel. Want to know how he opens the piece, how he ushers in the waterfall section, or guides the great climaxes at its centre, or the sombre ending? Or indeed to simply marvel at the wonderfully relaxed posture of his baton holding hand and wrist. It’s all there for you if you can get to it before it goes off air. There are also myriad close ups of members of the orchestra at key moments. I can tell you the makes of trumpet the orchestra use, what fingerings the strings employ in the difficult passages and how concertmaster Alejandro Carreño and his front desk colleagues display real authority, the fact that the contrabassoon player sports a prize winning quiff and that Balotelli look alike trombonist Christian Delgado has the meanest head shaving ever seen on a concert platform, together with the moment when Delgado’s colleague Leswi Pantoja decides to breathe in the really loud sections, and the French horn players swop their usual horns for Wagner Tubas. Oh, and how much they not only enjoy playing (which we knew already), but also how focused they really are in performance. And this is just to scratch the surface. From the trivial to the profound, the details are literally endless. Yes, I hear you saying, but how good is it? Well I heard three performances of the Alpine Symphony last week: live in the auditorium on the night of the concert itself, listening to the webcast a few days later, and then, just to top things off, listening earlier today to an old 1993 CD of Sinopoli and Dresden . Each one has its qualities. Live is live and being there will never be substituted with anything. The Webcast gave me views, information and insights I never even used to have when playing on the platform myself, but I had an amazing time listening to the Sinopoli because, well, there was simply nothing to do but listen, and boy, they play. If you want to trog through the archives I can suggest Strauss’s 1941 Bavarian State Orchestra recording, Kempe with the Dresden orchestra for whom it was written, the great Mravinsky/Leningrad Philharmonic pairing, or more recently Andris Nelsons with the CBSO. But if you want to be bang in the middle of a remarkable performance that just happened last week and that you will probably never have the chance to see or hear again, then pull up a chair, pour yourself a drink in the comfort of your own home, read the online programme notes (Wikipedia is also excellent by the way), and watch the end of the world as we knew it a hundred years ago. Next week I will report on the viewing figures and demographics of the performance. But for now, forget the restaurant at the end of the universe; this is the piece that ended the symphony. And it’s right before your eyes. On your marks, get set…. This entry was posted in Uncategorized and tagged El Sistema, Festival 2012, Gustavo Dudamel, Royal Festival Hall, Shell Classic International, Simon Bolivar Symphony Orchestra, Soudns Vene, Sounds Venezuela, The Guardian on 3 July 2012 by Marshall Marcus.